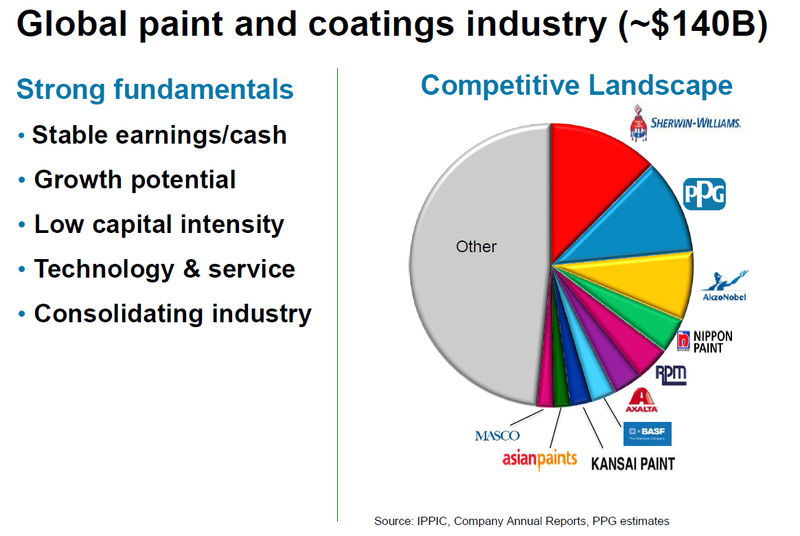 PPG Industries generates approximately $1.5B per year in free cash flow. That's a lot of money, but the free cash flow yield is just 5.4%, and that's a bit low. PPG has been very generous to its shareholders in 2018 as it returned $2.2B in dividends and share buybacks. 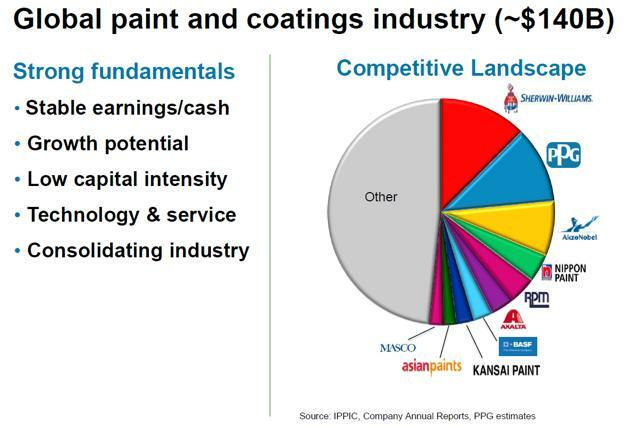 Considering PPG Industries (PPG) is a well-known name in the financial world and the world of coatings - it’s the second largest paint company in the world, ahead of AkzoNobel (OTCQX:AKZOF) (OTCQX:AKZOY) but trailing Sherwin-Williams (SHW) - I don’t think a lengthy introduction is necessary. 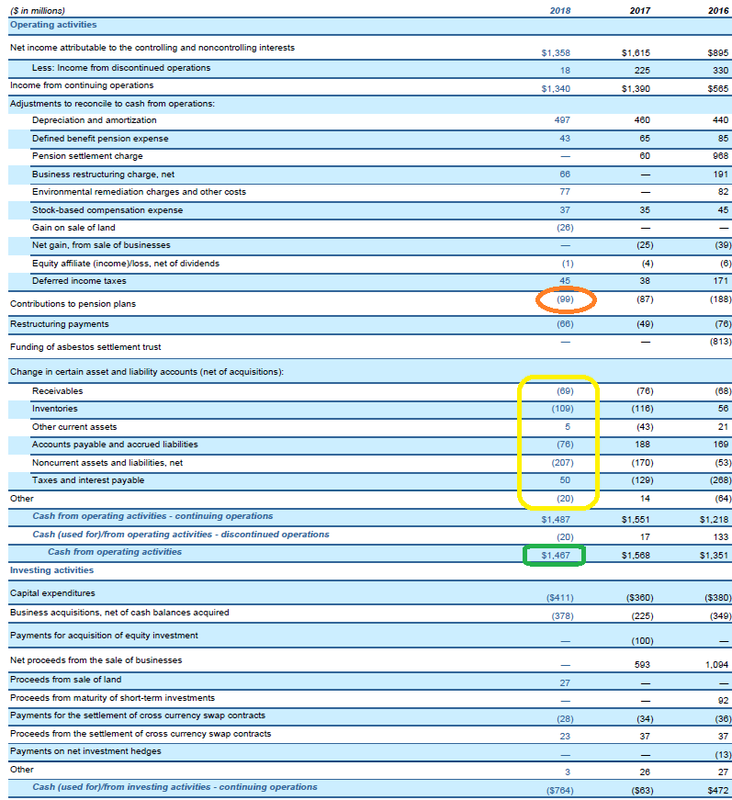 What really matters are the cash flows, and although PPG Industries was able to increase its 2018 revenue by almost 5%, its operating expenses increased at a much faster pace, which definitely created some margin pressure. Nothing insurmountable, but I get a bit itchy when I see companies spending a tonne of money on share buybacks and dividends in a period of decreasing margins. PPG’s revenue did increase by approximately $626M to $15.4B, but this doesn’t mean the bottom line also shows an acceptable and comparable increase. The COGS increased by 10% to $9B, and this did put some pressure on the financial performance, and PPG’s pre-tax income fell by 15% to roughly $1.7B. 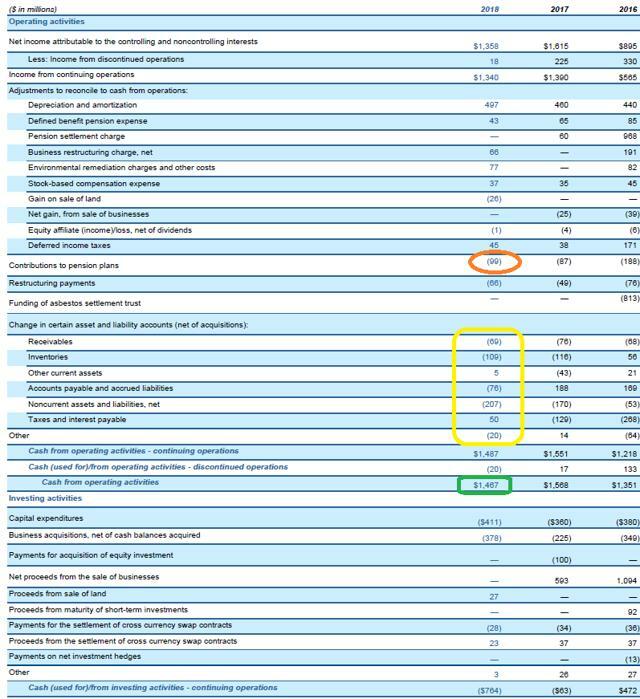 The escalation of the production expenses is quite intriguing though: Over the past two years, 2016-2018, PPG Industries’ total revenue increased by 7.7%. Not bad, but in the same period the COGS increased by 17.4%, so there is a very clear trend of operating margins coming under pressure. Although PPG Industries mentioned price hikes as a 2% contributor to the higher revenue, this wasn’t sufficient to compensate for the higher production costs. As expected, PPG refers to the cost inflation of raw materials as one of the culprits for the higher production expenses, but also points in the direction of applying a new revenue recognition standard in its accounting method. The bottom line shows a net income of $1.34B, which is much lower than last year’s $1.59B, but the difference could be explained by the contribution of discontinued operations to the consolidated results in 2018. In 2017, PPG Industries completed the sale of its fiber glass business so if we would be comparing apples to apples, the net income from continuing operations decreased by just 3%, which isn’t too bad considering the circumstances. This represents an EPS of $5.47 (including the $0.07 in EPS generated from discontinued operations), indicating PPG is still trading at in excess of 20 times its net income. Fortunately PPG Industries was transparent and also took the discontinued operations into account. The reported operating cash flow was $1.47B, but this result includes a net investment of $406M in the working capital elements, which means that on an adjusted basis, the operating cash flow would come in around $1.9B. This also includes a $99M contribution to the pension fund as well as a cash outflow of $66M related to restructuring the business. 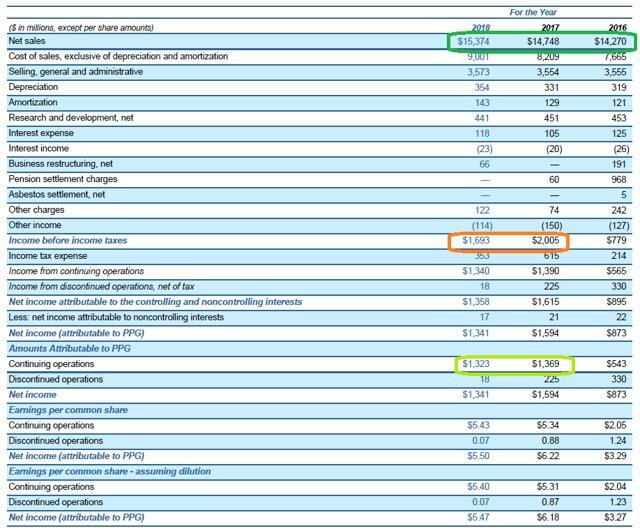 The total amount of capital expenditures was $411M, so it’s fair to say PPG Industries generated $1.5B in sustaining free cash flow in 2018, and this would have been around $1.6-1.65B if you’d exclude the payments into the pension fund as well as the restructuring charges. So the underlying business is humming along nicely. And based on the share count of 206M shares as of the end of January, PPG’s operations generated a free cash flow result of $6.25 per share for a current free cash flow yield of around 5.4%. In the past three financial years, PPG Industries has spent approximately $4.9B on rewarding its shareholders. The majority of the cash ($3.7B) was spent on buybacks, with the remainder spent on dividends. 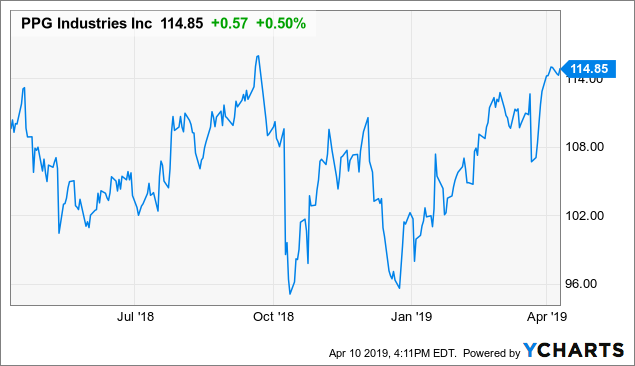 The reduced share count and increasing total amount of dividend payments made PPG Industries a very attractive investment for investors looking for dividend growth. But when you look at the 2018 cash flow statements, you’ll see the company spent almost $2.2B on shareholder rewards. On top of paying dividends to the tune of $453M, it also spent $1.72B on buying back its own stock. A solid move considering PPG wasn’t trading too expensive, but I always get a little bit nervous when I see a company spending $2.2B on keeping its shareholders happy while it generates less than $1.5B in free cash flow. Of course, PPG does have a good excuse. It recorded a total net cash inflow of $1.7B from selling some of its divisions in 2016 and 2017, but I think this excuse is only partly valid as PPG also spent $950M on acquisitions in the comparable period. While I understand PPG considers itself undervalued and it wanted to spend the money from asset sales on buying itself rather than pursuing even more external acquisitions, I don’t think the company should overspend on these buybacks. After paying the dividend, PPG should have approximately $1-1.1B in ‘available’ free cash flow, of which a part will have to be spent on additional smaller acquisitions, but this should leave close to a billion on the table for share repurchases. Plenty of money to continue to reward the existing shareholders without jeopardizing the financial health of the company. 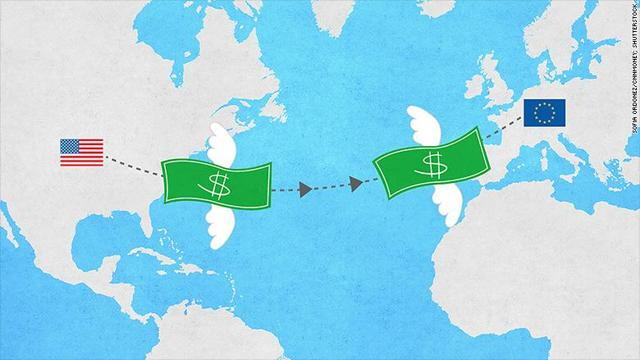 You could obviously still consider an investment in PPG Industries but personally, I’d prefer them to apply a slightly smarter capital allocation plan. If the company would reduce the buyback pace to a level that could be sustained through available incoming cash flow, PPG would still be able to buy back 3-4% of its own stock on a yearly basis, and that would also have a meaningful impact on the consolidated result. I currently have no position in PPG Industries, but I would consider writing out-of-the-money put options should the volatility increase the option premiums. Consider joining European Small-Cap Ideas to gain exclusive access to actionable research on appealing Europe-focused investment opportunities, and to the real-time chat function to discuss ideas with similar-minded investors! NEW at ESCI: A dedicated EUROPEAN REIT PORTFOLIO! Take advantage of the TWO WEEK FREE TRIAL PERIOD and kick the tires!